Who doesn't love a nice, cold brew? (I prefer cider, but that's beside the point...) While a sixer of supermarket Brewski Lite will do the trick, there's something to be said for a handcrafted ale. Once you get the hang of it, you could even whip up a signature batch for a special occasion, like my dear friends Joseph and Daniel did for my wedding last August! Before we get into any fancy recipes or too much of the chemistry behind the scenes, let's go back to basics. This will teach you how to brew a damned good beer even if the closest you've ever come to making your own is pouring it into a pint glass. Most of the equipment you will need to brew a batch of beer can be found at your local homebrew shop or craft beer store. In case you don't have access to something like that, you should be able to find everything on Amazon or northernbrewer.com. Some items (such as a lauter tun and or wort chiller) can be fabricated with minimal tools and much cheaper than buying at retail price (great instructions on making these items can be found with a quick internet search). Base Malt This consists of barley that has been partially germinated and kindled. It serves as the bulk source of sugars extracted during the mash. A good standard example is 2-row barley. Speciality Malt These add character to the beer such as body, color, some bitterness, acidity, etc., depending on the grains chosen. Since we are brewing a stout, we need dark grains such as chocolate malt (Not actual chocolate but has been torified extensively to give it a very dark hue and charred grain). Hops The female flowers of the hop plant add the bitterness and hoppiness during the boil. A general rule of thumb is that, during the boil, early hops add bitterness, late hops add flavor and even later hop additions add aroma. Yeast They break down the sugars, leaving behind carbon dioxide, various flavors, and the all-important alcohol. 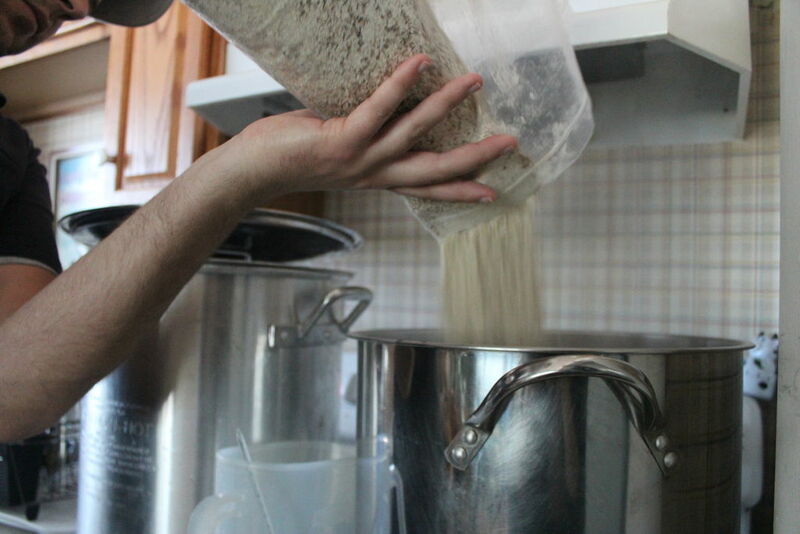 The first step in brewing is the extraction of fermentable sugars from grains. The malt is steeped in water at ~120F for 20 minutes to break down large bulky proteins, a process called the protein rest. It uses the naturally-occurring proteolytic enzymes in the grain, which are only soluble at these temperatures. A protein rest help head formation and retention, but is optional in most cases. After the protein rest, the mash is stepped up to ~150-154F. At this stage, the proteolytic enzymes are inactivated and the malt enzymes (alpha/beta amylase) take over and break down starch into simple fermentable sugars. It is important to keep the temperature of this step within the desired range as higher temperatures will result in more complex sugars that yeast have difficulty fermenting leading to residual sweetness in the beer (some beer styles will call for this effect). After the 1 hour steep at 150-154F bring the mash to 170F. This step inactivates remaining enzymes and locks in your sugar profile. Additionally, raising the the temperature to 170F help facilitate efficient sugar extraction. Wort (the sugary liquid) is then extracted from the mash. This consists of filtering the wort through the grain bed until it becomes clear (clearish in reality) and then collecting it into your boil kettle. The grain bed sediments, producing a molecular sieve that filters out the majority of unwanted crud (large proteins, free lipids, sediments, etc). You will also need to have about 5 gallons of water at 170F ready to rinse the grain bed. A helpful hint is to filter/rinse the grains slowly to increase sugar extraction. Also, try to keep the water level about 1 inch above the top of the grain bed until the final runoff to prevent the grain from becoming too compact and clogging. After collecting about 6 gallons of of wort, the boil is started. 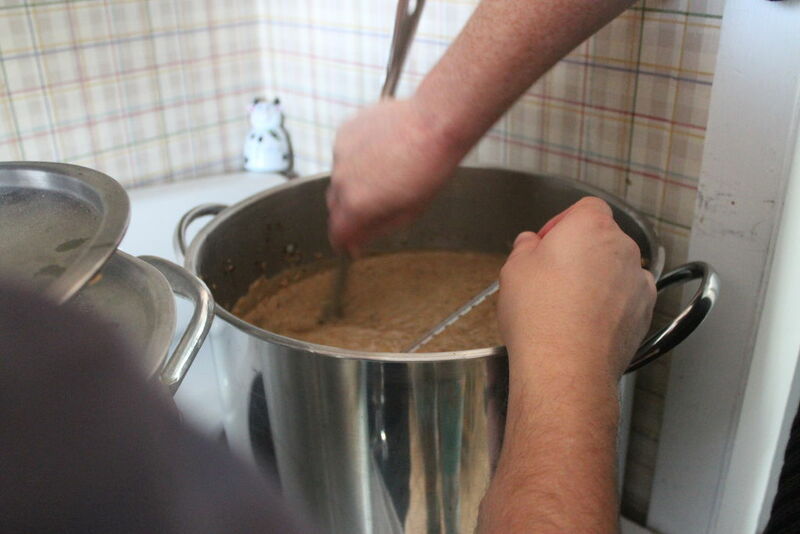 ​Bring the wort to a boil, being careful not to let it boil over. Hint: As the wort gets close to boiling temperature, protein will collect at the surface. When you get to this point, decrease the temperature of your heating element a bit until the protein falls back into the wort. After the wort starts boiling, add your bittering hops slowly (adding all the hops at once will cause a boil over) and set a timer for 60 minutes. Flavor hops will be added around 30 minutes into the boil and and aroma hops are added 55 to 60 minutes into the boil (right at the end to prevent boiling off the volatile aromatics). FROM THIS POINT ON, EVERYTHING THAT TOUCHES THE BEER NEEDS TO BE THOROUGHLY CLEANED AND SANITIZED! When the timer goes off, crash-cool the mixture using a wort chiller. If you don’t have a wort chiller, you can fill your sink or tub with cold water and ice and place your boil kettle in the icy bath. 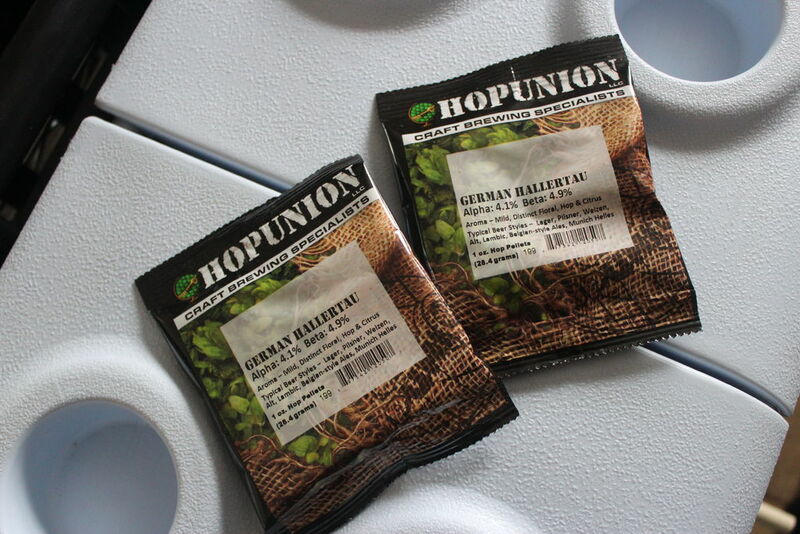 Hint: A vigorous stir will help hop matter and other cold break (trub*) to collect in the center of the boil kettle. Siphon the cooled mixture into a fermenter to remove the trub. Hint: Siphon from the side to avoid the trub. 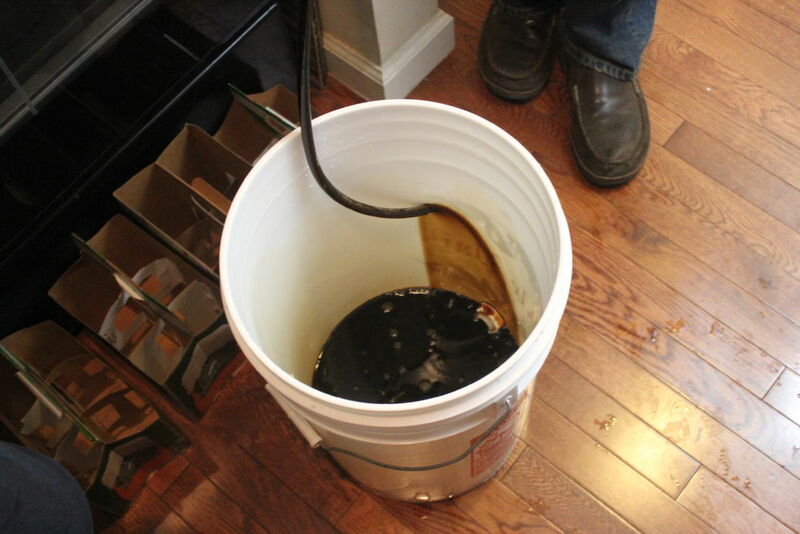 Siphoning through a funnel with a filter or cheesecloth will help to remove additional trub. Cover (using an airlock) and set the wort aside to cool to fermentation temperature before pitching the yeast. On cold winter days, the beer can be placed outside to bring the temperature down. For an ale, fermentation temperatures generally fall within 62-70F. It is important not to ferment above this temperature, or off flavors will be produced. 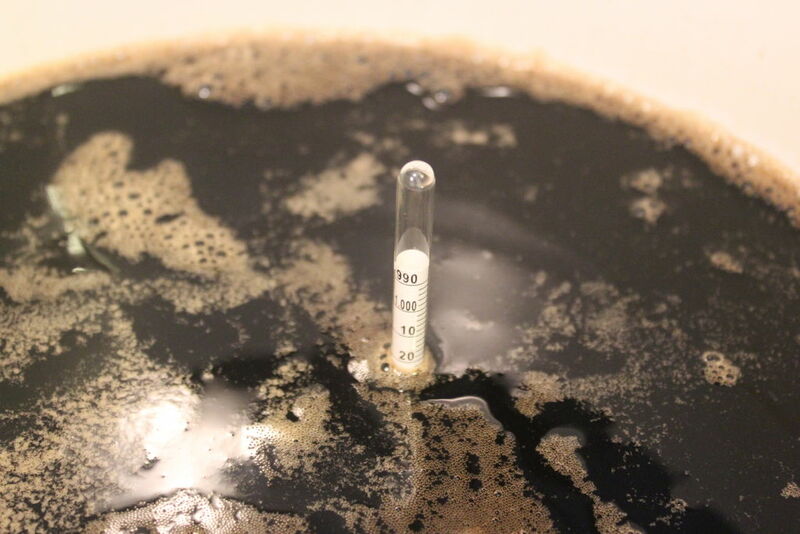 *Trub is the gunky sediment left at the bottom after cooling the wort. Fermentation is the best part of the process because this is the part that puts the booze in the beer! Once the wort in the fermenter has cooled to fermentation temp (~65F), shake the fermenter vigorously to oxygenate the wort right before adding the yeast. You can’t oxygenate too much (unless you inject pure O2) so go nuts! Oxygen produces very healthy yeast and helps them replicate before they start chewing up sugars. 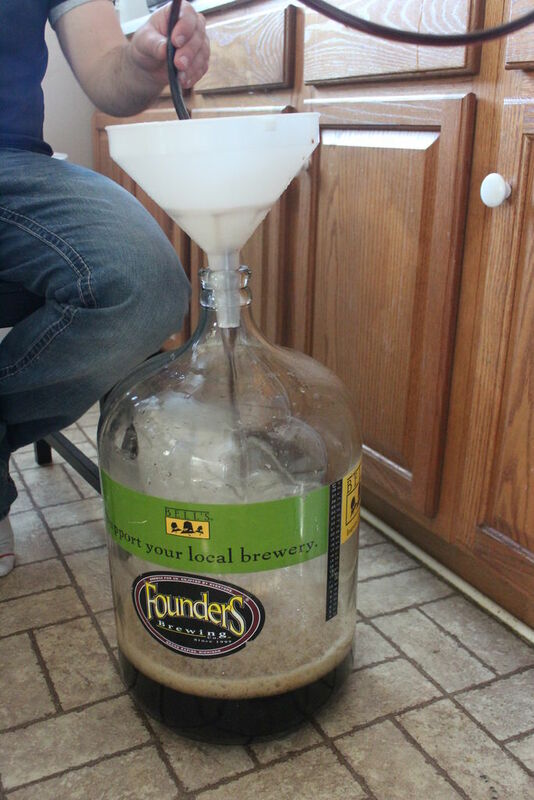 Keep the fermenter in a cool dark closet and the beer should start bubbling within 24 hours. Remember, the beer generally should not go above 70F so take care to keep the beer cool. The primary fermentation typically takes about a week (depending on the beer). Bubbles out of the airlock should form at less than one per minute when the beer is approaching completion. A good indication of a complete fermentation is when the hydrometer reading doesn’t change after a day or two. Siphon to Secondary Fermentation Secondary fermentation may not be necessary. When siphoning, don’t siphon the yeast cake that will have formed at the bottom of the fermenter and avoid introducing oxygen into the beer (this happens when the beer splashes, so be gentle). Secondary fermentation lasts as long as the recipe dictates, but generally about a week should be fine. Your beer is nearly ready! All you need to do now is bottle. Siphon your beer to a bottling bucket. Use the bottling wand to fill your sanitized bottles*, and then hand-cap them to seal. Condition the beer in-bottle for two weeks (maybe longer depending on your beer). Once the beer is sufficiently carbonated, it's ready to drink! It's not a bad idea to condition your brew in the fridge for another week or two to sediment down any remaining yeast and crud. *It's crucial that bottles be completely sterilized to prevent contamination. Now that you're ready to show your masterpiece off to the world, you need to get it packaged up for presentation! I love the labels too! So glad you like the labels, Jessy! And yeah - we wanted to make sure to start at the VERY beginning before delving into recipes and whatnot.